Successfully Added Multi Purpose Security Surveillance - DIY CCTV System (PAL) to your Shopping Cart. Multi purpose security surveillance CCTV system with two wireless cameras and one wireless AV receiver. Have you ever though about setting up surveillance in your home or office but thought it will be too complicated? Well, brace yourself for this easy to setup wireless monitoring camera system (with audio) that makes having your own wireless CCTV security system finally within reach of the average person. The multi purpose security surveillance system kit comes with a wireless AV receiver with 2.5 inch TFT LCD screen and two wireless cameras with high quality CMOS image sensors that can be used up 50 meters from the receiver. This system can work in temperatures between 0 - 50 degrees centigrade, so they can be used anywhere indoors or in covered outdoor environments. Better still, this is an advanced feature system that has 4-channel auto adjust so the wireless signals do not to conflict with other nearby wireless devices. Saw something interesting? Planning to record "something" on disk or tape? Then connect the wireless receiver to a recorder via its A/V OUT port for archiving your security video. There is also an A/V OUT port if you wish to view your surveillance video on a bigger screen. This multipurpose wireless surveillance unit both enhances your daily life and improves home/office security measures. Whether you use this security camera kit to keep an eye out on the kids or safely monitor you important workspace, this really convenient wireless surveillance system provides absolute peace of mind at a very affordable price. In these tough economic times, why not save some money by staying home and doing some improvement work on your home during your next holiday? Upgrading your house is a great way to give yourself long-term pleasure and peace of mind, and you will enjoy this security surveillance system much longer than any trip you would have taken to some crowded and overpriced tourist trap. Protect your property and family, place a couple of cameras around your home so you can keep and eye out on the kids whether in their play rooms or in the garden. 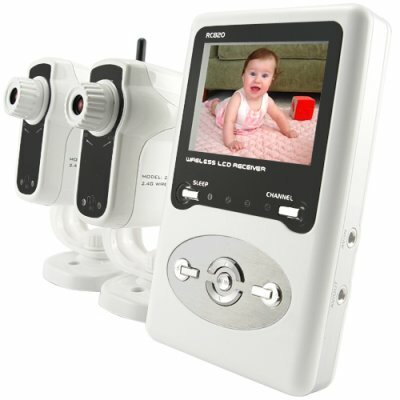 Using it as a baby monitor, you will be able to see your baby as well as hear your baby (audio and video output). Workers slacking off at work? Well as long as its not freaky Friday, then setup a couple of the wireless cameras and see whose misbehaving!